What features are important when shopping for a Kitchen Faucet: price, quality or style? How about all three? We have a large variety of kitchen faucets - all beautiful, high quality and priced to sell. All that is need is to select the style. Choose from the categories listed below or from the manufacturer list. 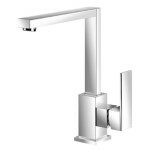 We carry quality faucets with strong warranties. Our products come to you factory direct and we pass those savings on to you, giving you high quality at reasonable prices. You don't have to wait for specials, search for a coupon, or cross your fingers and hope for a good deal. Our kitchen faucets are always on sale. For easier shopping choose a style below. Click on the picture to find out more about sale prices. 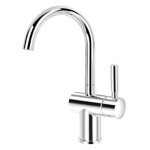 The culinary kitchen faucets have a spring that allows you to pull the faucet head where it is needed. When finished the spring pulls the spray head back into position and you can lock the spray it in its cradle. Pull down faucets are usually taller than standard kitchen faucets. The spray hose neatly rests inside the faucet. Pull-out faucets are usually shorter than the pull down variety. The hose still tucks neatly into the the spout. Rotate the lever to adjust the water temperature and flow. 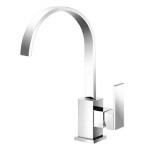 Find modern, sleek single hole kitchen faucets. 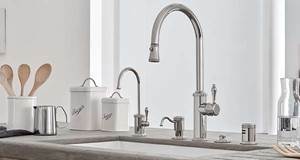 Beautifully functional widespread & single hole kitchen faucets with side spray. Squeeze the handle of the side spray and the water diverts from the spout to the spray. These pot fillers have dual joints so they will fold out of the way when not in use. When in use they will easily fill stock pots, water bottles, vases and provide a second source of water in the kitchen.